Joel Silverstein and Richard McBee, Exhibit Curators, Jewish Art Salon. From the invention of Superman by Jerry Siegel and Joe Schuster to the graphic novel “Maus” by Art Spiegelman, Jewish artists and writers have served an essential and indispensable role in the comics and graphic novel industry. This exhibition boasts a roster of cutting edge creators, reinvestigating traditional genres like superhero, political satire, romance, horror, science fiction and confessionals through a Jewish lens. Join us for a look at how these contemporary Jewish artists use the comics medium as a way to express and address their own Jewish identity and cultural experience while also examining the complex relationship of art, identity and culture within the Jewish community at large. More information here. 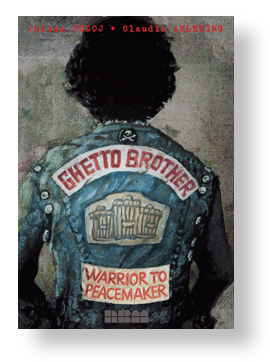 The exhibition will feature artwork from “Ghetto Brother” by Julian Voloj and Claudia Ahlering.